Trevor's new sport boots are designed to meet the demands of every horse and rider within all equine disciplines. The All-Around Sport Boots are the pinnacle of protection and have a streamlined fit that contours to the cannon bone and fetlock while preventing the build-up of dirt and debris between the boot and the horse. 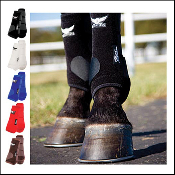 The base of the boot is cut higher and matches the natural curve of the horse's lower leg, allowing full flex and extension without interference from the boot. The All-Around Sport Boots are constructed from top-quality materials and carry Pro Equine Product's (TM)Patented Sling Technology (PST), which increases tendon and ligament support while reducing hyperextension and concussion caused by cross-over interference.